House arrest should not prove too irksome for Robert Mugabe. 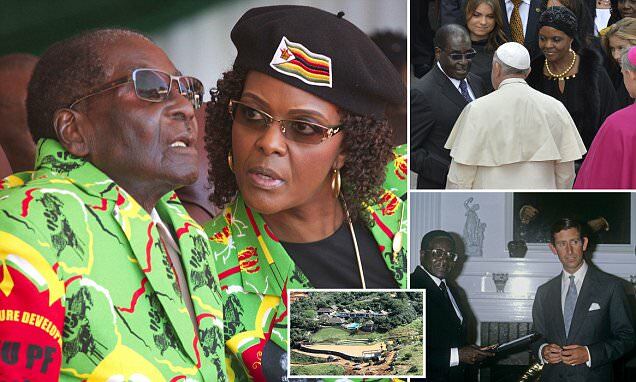 After all, the house in question is most likely the 25-bedroom mansion in Borrowdale, an affluent suburb of Zimbabwe’s capital Harare, built for the now-deposed president and his wife, ‘Gucci Grace’. A gilded cage, quite literally, in the baroque style, marble-clad, drenched in gold leaf and with two swimming pools and a state-of-the-art security system, it is a study in vulgarity. This wedding cake of an edifice, built at vast expense, is an opulent rebuke to millions of ordinary Zimbabweans who must daily contend with appalling poverty, struggling by on barely a dollar a day. If the 93-year-old dictator is permitted to serve out what time remains to him in such a setting, he should be grateful. Others of his kind ended up swinging from lampposts. And 93 is a good age in Zimbabwe — a very good age. When Mugabe came to power in 1980, the life expectancy of a Zimbabwean male at birth was 59. It is now 58. This is testament to a regime that has transformed what was once one of Africa’s most prosperous countries, endowed with fertile lands and mineral wealth, into an economic basket case where in 2008 the monthly inflation rate peaked at 79.6 billion per cent. If one object sums up ‘Comrade Bob’ Mugabe’s custodianship of his country, it must surely be the production of the One Trillion Dollar note. The hyperinflation of Weimar Germany appears like a minor glitch in comparison. Luckily for Mugabe and his wife, there is plenty of hard currency stashed away in family bank accounts in Asia and elsewhere, as well as property in Hong Kong, Dubai, Malaysia and South Africa.